Continuing his dream run, Kadambi Srikanth defeated Olympic champion and world No.4 Chen Long in the final of the Australian Open Super Series by 22-20, 21-16 to win the tournament. Kidambi Srikanth has been in red hot form in the past two weeks – he has beaten the World No 1 Son Wan Ho twice and beaten the top-ranked Chinese shuttler Shi Yuqi twice. Overall, he has now reached three straight Super Series finals in a row that he’s played – Singapore, Indonesia and Australia. 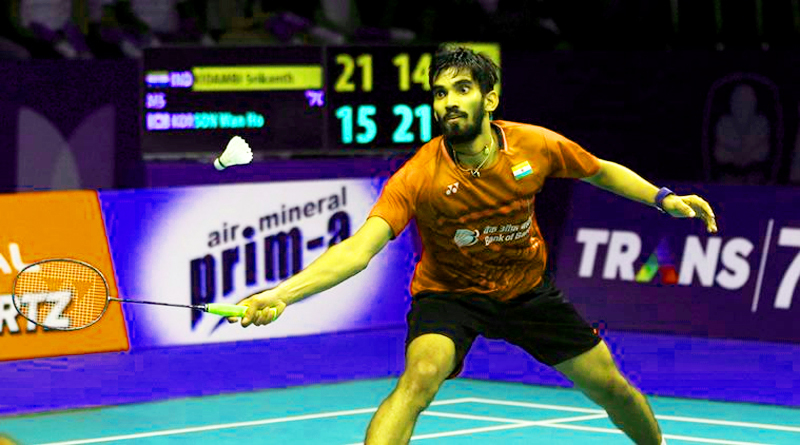 Kidambi Srikanth exhibited another flawless performance to beat Chen Long of China. Srikanth, who came into the final as the underdog having lost his previous five encounters against Log, registered his first victory over Long to win in straight sets. This was the second consecutive title for Kidambi, having one the Indonesia Super Series only last week. Srikanth came back brilliantly after trailing early in the opening game to lead 11-9 at the interval. It went neck and neck after the break but it was Srikanth who held his nerves in the end to edge the game 22-20.Srikanth started the second game in royal fashion by unleashing a 331 kmph shot to win the first point after a long rally .The game was fiercely contested with the score at 9-11 midway of the game. Srikanth played some aggressive shots after the break to race to a 4 point lead. Clearly on the back foot, it was a matter of minutes before Long gave up to hand Kidambi the victory in just 45 minutes in the Men’s final. With this win, Srikanth clinched the top spot in the BWF Dubai Destination Rankings.